"Looking through a canopy to Moomaw Hall under a stand of sweet gum tre" by L. Michael Hill Ph.D. Looking through a canopy to Moomaw Hall under a stand of sweet gum trees in front of Wright Hall. This picture was taken under a stand of sweet gum trees, Liquidambar styriciflua (Altiginaceae). 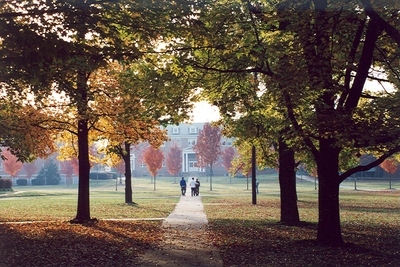 You are looking through that canopy to Moomaw Hall in the distance. These trees stand in front of Wright Hall.